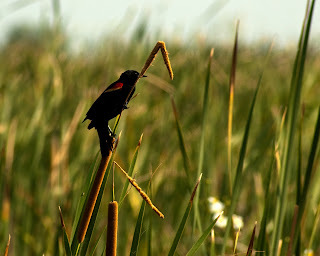 I shot this at the Emeralda Marsh early one morning. This male RSBB was singing, seemingly welcoming the morning sun and the lifting of the fog. This bird has one of the best songs going, right up there with the mockingbird in my opinion. I see more of these birds at the Emeralda Marsh than anywhere else. The wildlife drive will be closing soon which means I'll be walking the trail or seeing fewer of these until next year.